One of the biggest transitions from home life to dorm life is having to clean up after yourself. This applies to almost every aspect of college from bedroom to shower to laundry. Here are a few tips to picking out the perfect laundry situation - whether that's a laundry bag, laundry hamper, laundry basket or several combinations! Between eating in your room, piles of dirty clothes, windows that might not open, and taking out the trash, your dorm might not smell tiptop all the time. To make your room smell better, try air fresheners or odor eliminators. These are two great options depending on you and your roommate's preference. If the distinct scent of an air freshener isn't right for you, an odor eliminator that neutralizes odors might be just what you need to make your room smell fresher. Which Laundry Hamper, Bag, Basket is Best? 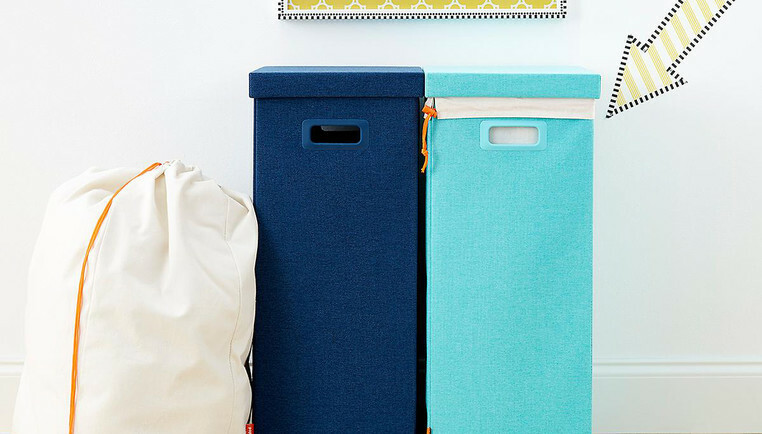 With different sizes of laundry hampers, as well as different designs - it's important to consider your dorm room and your dorm building when picking one that's just right for you and your needs. Do you live on a floor with a laundry room? If not, you might want to consider a laundry bag you can actually carry like a backpack - making trucking everything up and down so much easier. Do you live on the level with the laundry room? Think about a rolling hamper - making it a breeze to roll down the hall, unload and roll back! You might also want to think about picking a laundry solution perfect for the laundry that you clean! Are most of your clothes athletic wear in need of frequent washes? Bags, hampers and baskets with wide openings are perfect to throw everything in and go! Do you mix between your nicer clothing and more casual? A divided hamper might be perfect to separate lights, darks, delicates and casuals! No matter what you need, we have a solution for every need!